RTF has one major advantage compared with Doc – it is compatible with open source text editors and viewers. If your Doc files cannot be opened by your existing software, you will definitely solve this problem using convert Doc to RTF command line converter – Total Doc ConverterX. It is a multi-user version of converting utility that is installed on a web-server and services many clients at once. Ability to put every source file page to separate file. For this Doc to RTF converter no GUI is developed, as it is managed via command line. This utility can become a part of another web service. Using ActiveX you can easily integrate it into a GUI of web based application. It can be used for providing converting services for online users or for the users of local network. Passing tasks for converting Doc into PDF through web-server, you don’t need to install Total Doc ConverterX on each computer of the network. Install it on a web-server once, adjust for your needs and use it with ease for multiple conversions. It is possible to make it work automatically, setting the schedule and format parameters for regular conversions. Total Doc ConverterX is not resource-intensive service, it can work efficiently in the systems with basic parameters. It works quickly and correctly, giving users the copies in the right format. 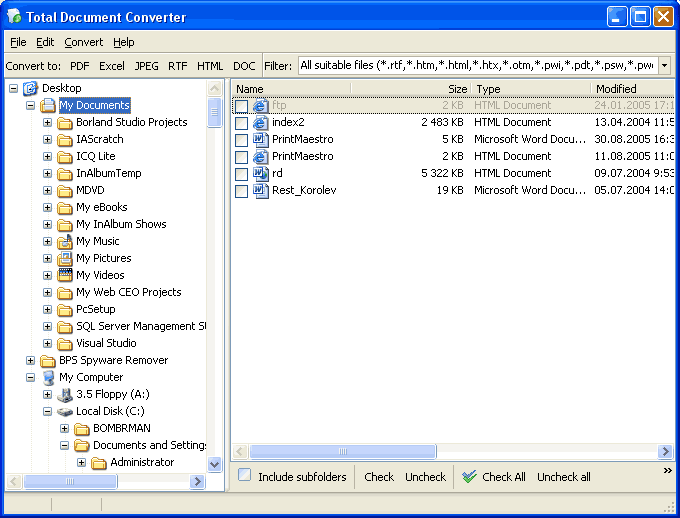 It is the most functional Doc RTF converter for web-server among today’s offers. You can get sure in this by testing a free trial version.